Coachman has been building trailers since 1964. Their acquired experience has been vital in developing great trailers that are equipped with the most relevant amenities one would look for in a travel trailer. 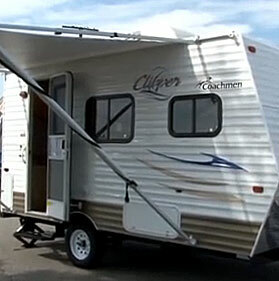 The Coachman Lightweight travel trailers range is a great example. This product is developed to suit today’s world by promoting efficiency in design and operation. Coachman lightweight travel trailers are built with lighter materials for easy towing with modern vehicles while the interior comes fully equipped and decorated to rival a home setting. Clever floor plan designs are used to ensure efficient use of the available floor space while maximizing on convenience and comfort. Clipper Ultralite travel trailers that provide lightweight value above the other models in this class. Each variation as you will see comes with distinct features suitable for specific end user requirements. This indicates how much Coachman has the end users’ preferences in mind during the design and building process. Common features for chassis of Coachman Ultralite models include powder coated I-beam frame with ultra-lube leaf spring axles for enhanced performance. Galvanized wheel wells coupled with heavy duty safety chains provide enhanced durability of the chassis. Efficient design dictates durability and strength of all parts. A front window with rock guard is complemented by radius tinted safety glass windows for greater privacy. The exterior housing is provided by a radius trussed roof with one piece rubber roof and R-7 insulation. A bike storage door, patio light and external speakers summarize the external features common to the line of Coachman UltraLite travel trailers. The Coachman UltraLite travel trailers are equipped with useful interior safety features such as a fire extinguisher, carbon monoxide, smoke and LP detector for fast detection and response to any fire or leaks. Trailer travel and camping is supposed to be fun, and Coachman have this in mind when installing relevant safety features to ensure that any unexpected fires or gas leaks can be handled in a timely fashion. 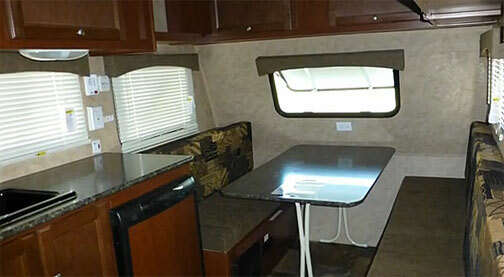 The most luxurious model of the Coachman Ultralite travel trailer is the Apex Ultralite model. These trailers have added comfort features aimed at enhancing the on road user experience by providing residential comfort features. Modern LED lighting and power tongue jack enhance models’ efficiency features. The high-rise kitchen faucet with an added pull-out sprayer adds to the kitchen’s “residential finish”. Frame-less dark tint windows are provided as an option for this model.